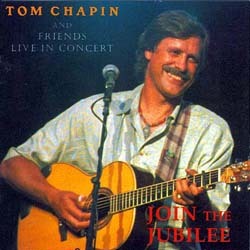 Tom Chapin "Join the Jubilee"
Recorded in Mamaroneck, NY, "Join the Jubilee" features Chapin delivering over an hour of material ranging from quiet ballads to playful romps. He takes the band (which includes banjo whiz Eric Weissberg) through 16 tracks, highlighted by several new Tom Chapin originals (two of them co-written by John Forster), a Rev. Gary Davis medley, an offbeat version of Weissberg's hit "Dueling Banjos," and four songs penned by brother Harry (one of which is the rare "Jubilation"). The New York Times calls Chapin "one of the great personalities in Contemporary Folk." Also known for his work in children's music, Chapin maintains an active touring schedule that includes concerts for each audience. "Join the Jubilee" is Chapin's first nationally-distributed release in ten years. It follows on the heels of the critically-acclaimed 1994 album "So Nice to Come Home," which was available from Sundance Music.